I love corned beef and cabbage and this on sounds delicious! 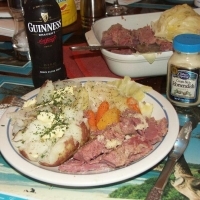 GF this sounds great I LOVE corned beef and cabbage ...a 5 well deserved! Ooh, I love a woman who's not afraid of a little garlic ;) Gorgeous recipe and I am saving this to try later.